The ancient Japanese capital of Nara has lots to offer visitors, including a range of UNESCO-listed sites like Todaiji Temple and a collection of gardens and parks. Here are some options to visit Nara on either a half- or full-day trip from Kyoto. 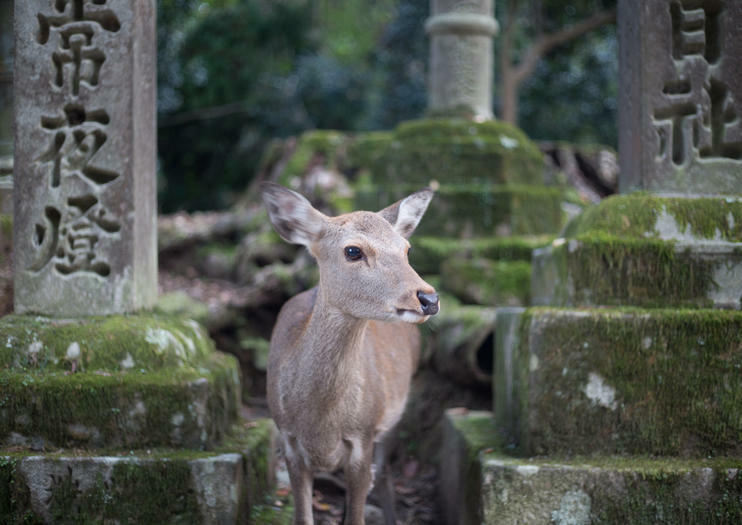 See more of Nara in less time on a half-day trip covering highlights such as Nara’s Shinto-inspired Kasuga Shrine, the thousands of deer at the famous Nara Park, and the iconic Todaiji Temple with its “Daibutsuden” (Great Buddha Hall). Full-day excursions offer a more leisurely opportunity to get to know the ancient Japanese culture and numerous landmarks in Nara. During your all-day visit, you’ll likely get to explore many of the sights mentioned above, plus other landmarks like Kofuku-ji Temple and Nijo Castle. Some full-day trips even offer optional side visits to Kyoto, or upgrades like a private tour or luxury transport. Nara is situated 26 miles (42 kilometers) from Kyoto, and is easily accessible by either train or bus. Trains leave Kyoto twice an hour, and the journey to Nara takes 35 minutes. Guests with time for independent exploration should consider stops at other Nara highlights including Yakushiji Temple, Isuien Garden, and “Naramachi,” the city’s traditional merchant district. Nara lies in a temperate climate zone, with hot summers and chilly winter temperate. Make sure to bring comfortable walking shoes and dress appropriately for the season. Discover the history and religions of ancient Japan during this 10-hour exploration of Kyoto and Nara. See Kyoto’s UNESCO World Heritage-listed Kinkaku-ji and Nijo Castle, along with its Imperial Palace. Then drive from Kyoto to Nara to explore its own World Heritage site, Todai-ji Temple (including Great Buddha Hall), plus Kasuga Shrine. You’ll also visit Nara’s deer park and sample a Japanese and Western-style meal for lunch. Your Nara and Kyoto visit also includes a guide, coach transport, all entrance fees and pickup at select hotels. Discover the historic environs of Nara, ancient capital of Japan, as you explore Buddhist temples, shrines and the famous Nara deer park on this 5.5-hour excursion from Kyoto. Visit Todaji Temple, one of the oldest Buddhist temples in Japan and home to the country’s largest Buddha statue, before seeing Kasuga Shrine, which features over 3,000 stone and bronze lanterns. Then stop by Nara Park, a 1,250-acre reserve that’s home to more than 1,000 free-roaming deer. Your Nara excursion also includes pickup from select Kyoto hotels, a guide and all entrance fees.